PURE whimsy, you might think. Nearly 100 years of linguistics research has been based on the assumption that words are just collections of sounds – an agreed acoustic representation that has little to do with their actual meaning. 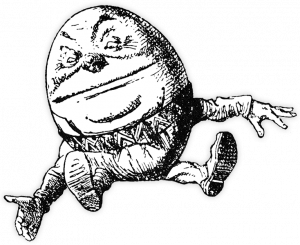 There should be nothing in nonsense words such as “Humpty Dumpty” that would give away the character’s egg-like figure, any more than someone with no knowledge of English could be expected to infer that the word “rose” represents a sweet-smelling flower. Yet a spate of recent studies challenge this idea. They suggest that we seem instinctively to link certain sounds with particular sensory perceptions. 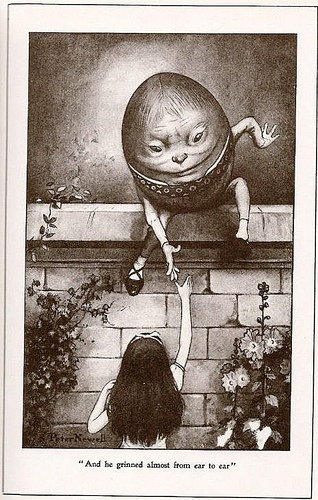 Some words really do evoke Humpty’s “handsome” rotundity. Others might bring to mind a spiky appearance, a bitter taste, or a sense of swift movement. And when you know where to look, these patterns crop up surprisingly often, allowing a monoglot English speaker to understand more Swahili or Japanese than you might imagine (see “Which sounds bigger?” at the bottom of this article). These cross-sensory connections may even open a window onto the first words ever uttered by our ancestors, giving us a glimpse of the earliest language and how it emerged. Happy 60th Anniversary of Disney’s 1951 Alice in Wonderland!